these events seemed chronological, at other times seemed to be more panoramic. The Dead in Christ Rise First. TV & Radio shut down for several Weeks. The dream began with an extremely loud noise. I saw people instantly come out of their graves. They were dressed in glimmering, glowing white clothing. I did NOT see them go in the air, I don't know where they went. Everyone wanted to know what happened and where did the people go that came out of the graves? Absolute hopelessness was in every heart, people were totally perplexed. The whole world was in absolute disarray. I walked the streets in shock. Everywhere there was absolute fear and lawlessness. Looting and murdering everywhere. After several weeks, television and radio communications began to slowly come back on line; however, all radio and television broadcasts were the same man promoting a "New Government and Leadership". This new man, whom I believe was the Antichrist, was emerging to lead us. This man, with olive skin and dark hair, spoke with great eloquence and charisma. He was soothing and promised answers to all the problems. He began to communicate through large, flat-screen televisions strategically placed nearly everywhere. Everywhere I looked all radios and televisions on all channels and frequencies were his speeches. That is all you could get on all radio and television twelve to fourteen hours a day. Hitler was not accepted when he first began, but this man was immediately accepted by almost all people. He gave new direction for the whole world. He spoke of the "new times" upon us as human beings, new directives for global peace and the need to give up current citizenship for "world citizenship". This man constantly spoke of "World Order" and the benefits of all men dwelling together in peace. This alarmed me to think of relinquishing my US citizenship, I was not convinced of this man's "New Order". My freedoms and patriotism were instantly eroded. People around the globe in staggering rates accepted his new plan. Nearly hopeless, I began to search for answers. While walking the streets one day, I met an elderly gentleman. Everyone else was in despair but this man was friendly looking. I asked him if he knew what was going on in the world? He told me the end was coming and that he had not prepared for the time of the Lord. [Most church leaders have shut the door on what Jesus is doing at the moment through His last prophetic move. They will find themselves engulfed in this Tribulation for failing to accept the ones God sent to promote further truth, particularly that of the Sabbaths which Jesus wants restored at this time.] At this statement, sadness filled his countenance. This man had a small following of others who had accepted the message of Jesus Christ. Even though we were a small group, we began to make significant progress in spreading the gospel and meeting the physical needs of others. Our spreading the gospel seemed to work out in the most unusual ways. We could tell God was with us. This small band of Jesus followers had faith. This was completely abstract to my thinking that God would actually be involved in the everyday affairs of those who followed him faithfully. Worldwide Earthquake kills millions of people. I saw a tall triangular building with a glass exterior fall and kill two hundred people. This building was not in existence when I had this dream, but it is now in the very place I saw it fall. The earthquake was worldwide and I had never heard of such an event reaching global proportions. Crops perish, Droughts, Famines, Pestilence. The weather completely changed. I saw winter weather in the summertime, summer weather in the winter. Winter became summer and summer became winter. No one could predict weather patterns.  All weather forecasts proved useless, it was as though the weather now had its own mind. Crops perished. Droughts brought famines and deaths. Deaths brought global pestilence. Local Police replaced by UN world Military Police. They drove very unusual looking vehicles – now known as Hummvees or Hummers. The men that were in them were dressed in all black uniforms with powder blue helmets. Some wore what looked like baseball caps. All of them were powder blue – now I know it to be United Nations blue. The new leader and his laws were not resisted. There were no longer any elected officials. The Constitution was not the law of the land. It was shocking how easily our Constitution was replaced with a peaceful "martial law". There was no privacy. Military police were everywhere, tracking and monitoring everyone and everything. I thought, "How did this happen to America so quickly and easily without resistance? Where were the ideas of our founding Fathers?" We were totally monitored and tracked. As time passed we came to realize that our television sets not only broadcast to us but also transmitted signals back to the military about us. We discovered our television sets were somehow watching us as if they were cameras with microphones! Television continually explained to us that we were now being saved from all their troubles by aligning ourselves with this "New Order". The "New Order" was said to have all the answers to our problems. [Typical Chinese propaganda.] This new leadership was necessary to bring change, to finally bring in the "New Order" of envisioned global peace. Avoid getting the Mark, Regardless of the Consequences! You could see the flames coming out from it. 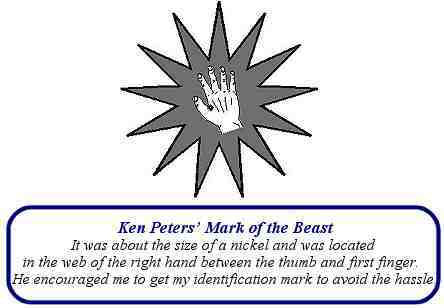 It was about the size of a nickel and was located in the web of the right hand between the thumb and first finger. He encouraged me to get my identification mark to avoid the hassle. This was to my utter amazement, seeing that I had never read the scriptures nor had heard of such an identification mark. The New Order began to recommend people get their identification mark. They sold the idea to the people much the same way the idea of using checks and credit cards convinced the public of their value. Soon pressure was increased to the point that you could not buy or sell without this mark of identification. The voice of the Lord tells me not to return to my home. I knew the end was coming fast and I needed to get to my wife. A strong internal voice was trying to lead me along. A voice kept telling me not to return to my home. I did not know to obey the voice of the Lord. I ran to my home to check on my wife as fast as I could. When I arrived shock and fear overwhelmed me. I began to understand what was happening on the earth. It hit me like a ton of bricks. I reached for my door knob, and I saw the door lock had been replaced with new locks. My privacy was totally violated. I will never forget the emptiness I felt as I saw the paint on the door from the previous locks. I was locked out of my own home. Again a voice spoke to me saying, "Don't open the door." I did not recognize the voice of God. In fear, I opened the door and was greeted by a devilish, sinister looking being. I asked, "Who are you?" It was a demon. I screamed in great fear and shut the door and woke up. Petrified and paralyzed from fear, I found myself lying in a pool of sweat, drenched from the agony of what I had seen. It was three o'clock in the morning and I was beside myself in anguish. I awoke my wife looking for solace, but she said it was just a nightmare and told me to go back to sleep. I knew God was trying to tell me something, but why? And why me? I got up and began to pace the floor of our living room but peace was not to be found. I was impressed to read the Holy Bible. I did not even know if I owned a Bible. I began to realize the absolute emptiness of my life – I knew no way out. I went outside to my garage and began to search frantically through many boxes of discarded items for a Bible. At last, I found it – a Saint Joseph Catholic Edition Bible. How it got there I have no idea. I went inside and began to read the book of the Apocalypse. I must have read four or five chapters before falling back asleep. As soon as I fell asleep the dream began again exactly where it stopped. Once again I was facing this sinister being. I was gripped with tremendous fear and ran off. I began walking the streets. Everyone was spiritually dead. Men's faces everywhere were filled with the dread. They looked as though they were in a catatonic state. Suicide rapidly became the answer to the dread surrounding mankind, men's hearts were literally failing them from fear. People by the thousands were committing suicide. The huge screen televisions kept broadcasting world events as though they were local news. The old Evangelist launched what he called the final all-out thrust, speaking the Word of God with reckless abandon. In pockets all over the earth, others began doing the same. I was able to see this awesome display of Almighty God's power at work. I could see the Global scene in full demonstration of who Jesus was and just what He could do. I saw miracles everywhere. God's people working miracles on a wholesale basis by all who were truly the Lord's people. This great outpouring of God's Spirit was tremendous and very widespread. Whole nations were being brought into the Kingdom of God. It only lasted a very short time. I was not clearly shown the time-frame, possibly six months. Then gross darkness once again began engulfing the minds of all who would not hear the message of hope. Not long after the evangelistic thrust began, we were captured by "military" agents. We were taken into custody and questioned regarding our affairs. These agents had firsthand knowledge of all our actions. It was as though they were with us the entire time. The questioning was kind at first. We were given an explanation of the "New Order" and it was stressed to us the need for our allegiance, since there was no more United States of America. The men speaking to us were very polished in their delivery and quite convincing about the need for our cooperation. We were eventually told we must not propagate the Gospel. We refused to stop our evangelism and were taken to another level of interrogation. The true heart of the "New Order" was finally revealed. The threats and taunts were now at full power. It was frightening. They told us their plan was to totally eliminate all Christians. They said our outdated religious practices were futile and that many Christians had cracked under the pressure of the "New Order", thus proving the emptiness of their faith. Mockery and insolence was the scheme of the interrogation, which lasted for hours. They began to ask us to deny "Him". They would never say the name "Jesus", they called Jesus, "Him." They could not say the name! If a man was not truly on The Rock of Jesus it would be easy for them to break – even the strongest. We were given divine strength and courage and would not back down at their threats. Finally, after many hours of interrogation, we were led down a very long corridor. Hundreds of people were in a single file line. Several doors separated this long corridor and at random times, more interrogators would burst forth and more in the line would fall away. After many hours we reached the last visible doorway. The door opened revealing an executioner and several agents. Now the full realization of what this was came to us. Fear gripped me! Never before had I experienced such fear! I began to shake. It was not shaking as if I were cold. I was shaking violently. I began to shake like a washing machine severely out of balance. Extreme chills engulfed my whole body. I could barely stand. My jaws became locked! This man had a black hood with holes for the eyes and mouth. He had a sword that looked like Sinbad's sword in movies. It looked like the sword on the Masonic emblems. The presence of evil was thick, it was literally tangible. The whole experience was horrifying and I knew now that the only way to be saved was to die for your faith. The time had come when the only way to be saved was to die for Jesus. Only a few times had I heard the term "martyr" and now I was about to become one. You are a coward! Give up and live! I did not know what would be better – to live in the earth the way it was, or to die. Confusion assaulted my mind. My old Evangelist friend was executed – right before my very eyes. I knew the end was coming, one way or another. The old man was not fearful at all. Next was my wife, I could not bear it all! I was tormented by voices saying, "You will deny 'Him!' You are a coward! Give up and live!" "Lord save me, I don't want to deny you!" was my call on the Lord for help. My mind was in complete hysteria and worst of all, I could not even speak out loud! I was emotionally paralyzed. Here my wife is now about to die and I can't even speak. Suddenly the door shut and I know she too is gone. It felt as though I would freeze, it was so cold and dreadful. I began to fear I would deny Jesus and renounce my faith in His Lordship. I felt complete hopelessness – the reality of denying the Lord was overwhelming! I could not speak to call on the Lord for help, so deep inside I said, "Lord save me, I don't want to deny you!" Instantly I felt a hand touch my right shoulder and great warmth and peace flooded my whole being. I looked back to see who was with me, and there stood Jesus. "Fear not, for death shall never hold you, my son." ... absent from the body ... present with the Lord. The door opened again. This time it was my turn. I was laid face up on a table in the shape of a cross. My body was strapped to the table on what would be the vertical part of the cross and my arms were strapped to what would be the horizontal part. I saw my body bleeding profusely. The executioner and the agents made several comments about how much more I bled than most. I bled so much that the executioner took off his mask shouting, "I will not kill another one of these people." I awoke from the dream, very, very shaken and needing many answers. KP. Understanding The Book of Revelation (Rev) from Midnight Ministries, explains about the Mark of the Beast, the Great Tribulation, and other vital end-time issues. Olive skin and dark hair are features of the Chinese. Other prophecies reveal that the Chinese are to take over the USA, along with other countries, obviously under the auspices of the United Nations. This information is provided in Tje Imminent Fall Of America (USA).